The archaeological excavations in the area known as “Misarite" near Sozopol have been led by Assoc. Prof. Dr. Krastina Panayotova from the National Institute and Museum of Archaeology of the Bulgarian Academy of Sciences and Dr. Alexandre Baralis from the Department of Ancient Greek, Etruscan, and Roman Antiquities in the Louvre Museum in Paris, France. “This year we have studied one structure and a total of eight funeral facilities. For a person who has been studying the necropolis of Apollonia for so long, it has been a very pleasant surprise for me to discover a ceramic sarcophagus in situ," Panayotova has told the Focus news agency in an interview. 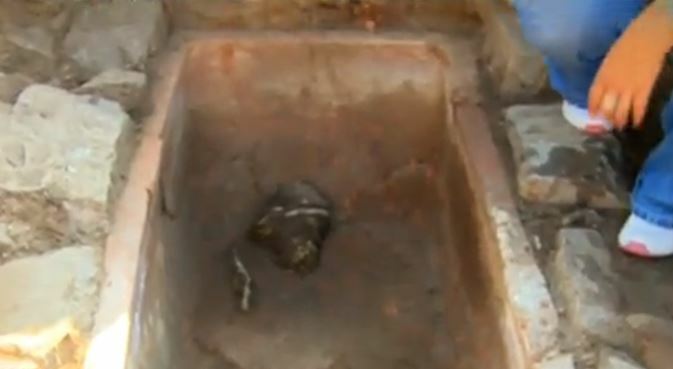 “[The sarcophagus has] the shape of a bathtub. It was covered with slabs that had been specially made," she adds. “It is interesting because [sarcophagi] are very rare in the necropolis of Apollonia. From a total of some 3,000 funeral facilities that have been studied so far [over the years], this is only the third [sarcophagus] that I know of, and the first one to have been found in situ," elaborates the archaeologist. The inventory found in the 3rd century BC funeral is also very interesting: the person buried in the ceramic sarcophagus has a funeral wreath on their head. The wreath is made of lead with small gold leaves and gold-plated ceramic “pearls" which are connected to the lead base with bronze wires. The leaves and the pearls imitate the leaves and fruit of the Bay Leaf plant, according to the archaeologists. 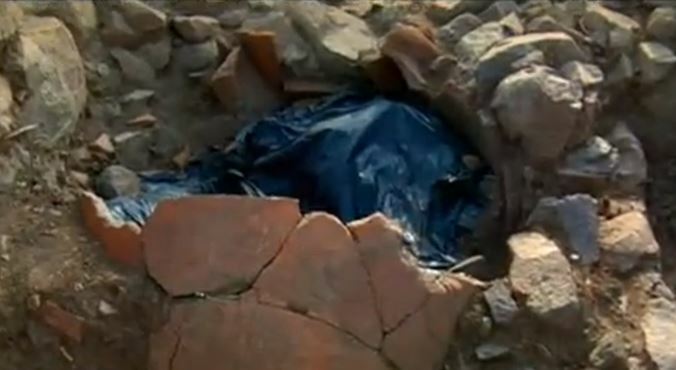 Next to the funeral with the ceramic sarcophagus in the necropolis of the Ancient Greek polis of Apollonia Pontica, the researchers have found a grave containing a sarcophagus made of limestone. “This, too, is a rare occurrence. Until now, there had been only one marble sarcophagus discovered in the necropolis of Apollonia, and this [newly found one] is only the second of this kind," says Panayotova. 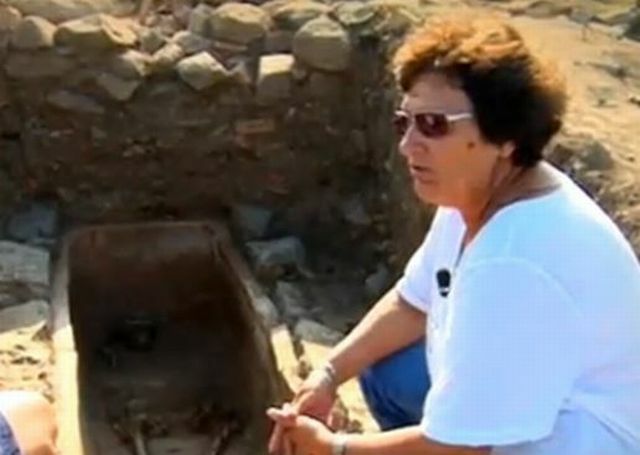 She reminds that the necropolis of the Greek polis in today’s Sozopol on the Bulgarian Black Sea coast is located amidst the ruins of suburban villas and estates that were situated outside the fortress walls of the ancient city. “The funeral remains in the area called Misarite are filling [knowledge] gaps that have existed with respect to the funeral facilities of the necropolis of Apollonia. These funerals were performed after the buildings that had existed in this place had been abandoned, and had begun to collapse. It was in their ruins that these funerals were performed in the first half of the 3rd century BC," elaborates the lead archaeologist. In another one of the graves from the Apollonia necropolis excavated in 2015, the researchers have found a person buried in a pithos, i.e. a giant ceramic vessel, most often used as a container for storing grain. “In some cases, the interpretation goes that the ceramic vessel imitates the [mother’s] womb, and the person is sent back into the ground the way they were born – inside a womb," explains Panayotova, as cited by the Bulgarian National Television. She says that both the ceramic sarcophagus, and the pithos found in the graves have led her to believe that the residents of Apollonia Pontica might have relied on pottery making for some of their livelihood because they obviously could afford to produce such large and complex ceramic containers that did not fit inside a “standard" pottery-making kiln. The bone material from the newly excavated graves is to be examined by anthropologists in order to find more about the population of the Ancient Greek Black Sea colony of Apollonia Pontica. “We know that the ancient Apollonians ate a lot of plant food. What was interesting for me was that they ate less fish that one would expect from residents of the Black Sea coast. Of course, they suffered from various diseases and infections. It is also interesting that the residents of this place had dental cavities 2,500 years ago," Panayotova notes based on her years of exploration of the necropolis of Apollonia Pontica so far. Earlier this summer, during their digs in the Apollonia necropolis in Misarite near Sozopol, the archaeologists found unique roof tiles with stamps which appear to have been dedicated to god Apollo. “I hope that we will be able to continue to explore this very interesting site because this is the first time such a comprehensive research of a suburban estate of an Ancient Greek colony has been undertaken in Bulgaria," states the lead archaeologist. She adds that the National Institute and Museum of Archaeology of the Bulgarian Academy of Sciences has been working on the site near the Black Sea town of Sozopol in cooperation with the Louvre Museum in Paris since 2002. The two institutions have just completed their second cooperation contract for the excavations of Apollonia Pontica, and Panayotova hopes that a new, third contract will be signed in 2016. With their excavations of the villas and estates outside the Ancient Greek polis of Apollonia Pontica (Sozopol) and the necropolis found there, the Bulgarian and French archaeologists are trying to expand their understanding of the economic life of the Greek colony. The beginning of the civilized life in the estate in the area known as Misarite is dated to the 5th century BC, and the structures and artifacts found there so far indicate that the villas there were inhabited seasonally, i.e. only during certain periods of the year. “The fact that we have not found enough remains of hearths and heating inside the buildings, and we haven’t even found enough cooking vessels, indicates that this place was used seasonally. It was connected with some sort of work," explains further Panayotova. In her words, some of the finds such as fragments from amphorae and pithoi spread over a large area allude to the fact that the seasonal occupation in question of the local population might have been vine growing. “Apollonia was very important in the 5th-4th-3rd century BC. But until now we hadn’t had the opportunity to find out where the potential of this city came from. Without its economic foundation we wouldn’t be able to understand how it functioned. Now we have found that at first, there were some mines in the [Stranzha] mountain which operated in the 6th century BC but after the 5th century BC the territory [of the polis] expanded, and there had to be a greater [economic] potential for the people living in the city," says in turn French archaeologist Alexandre Baralis, as cited by BNT. “At the beginning, the life of the Ancient Greeks in these lands was indeed connected with copper mining. You know that the Strandzha Mountain is rich in polimetal ores. It was this copper mining that allowed Apollonia to rise, and even to build a 13-meter tall statue of god Apollo, for which the Athenian sculptor Kalamis was invited," adds Panayotova. “The material from the mines was worth a lot but after the 6th century BC, based on the condition of the economic life, something more must have been found," Baralis adds. In their excavations of the suburban estates outside Apollonia Pontica, the Bulgarian and French archaeologists have been looking precisely for these kinds of answers. Starting with the latest archaeological layers, which are on top, however, they have been unearthing the ancient necropolis dating back to a later period, the 3rd century BC, which was formed amidst the ruins of the earlier estates. “The owners of this property, of these estates used them in order to bury their dead in a safer place. Based on the date we have, we can say that the [estates] were abandoned in the tumultuous times after the death of Emperor Alexander the Great, and the infighting among his successors, the diadochi… At the same time, this period, the end of the 4th, and the beginning of the 3rd century BC, is the time of the Celtic invasions of these territories. So these were just tumultuous times that forced the people to go back inside the fortress walls of the city," lead archaeologist Panayotova concludes.